We are aware of customers reporting similar emails at this time. Our engineers are working very hard at getting our stores back up and running smoothly. We do not yet have an estimated time as to when this will be resolved, but I can assure you that our teams are hustling to get this cleared up for us as soon as possible. I’m happy to take a look at your account and make sure that it’s still active for you though! The 50gb plan is not discontinued. We are investigating the email that you’ve received though. In Germany I see no plan other than the 50GB I am currently subscribed to. I can only downgrade as an option. 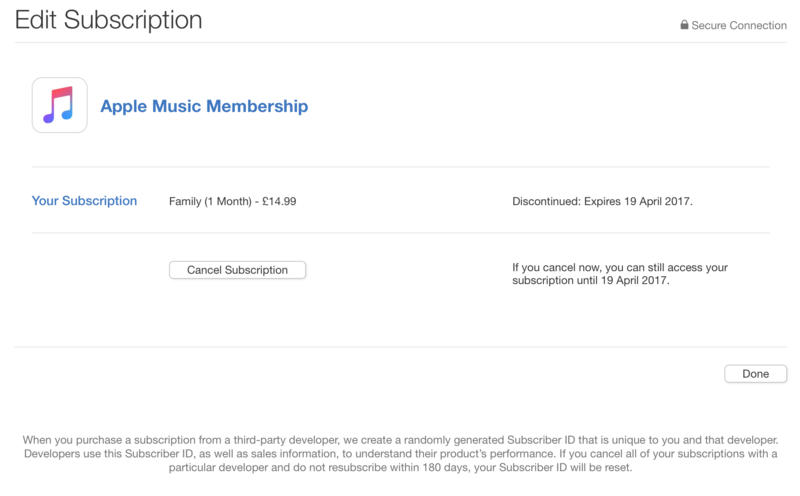 My iTunes subscriptions (Netflix and iTunes Match) are still ok. I am in Manila on business and cannot change my plan from 50GB - "Cannot connect to iCloud" I have not notice any issues with my iTunes account (songs or authentications for content on Apple TV). My son in Singapore cannot upgrade his plan which has been downgraded to the free level 5GB (we are on a family sharing plan) and is receiving error messages about his email and storage. Had the same notification regarding Apple Music Family Plan. Ended up verifying credit card info, which needed the security code, and it returned to normal a few minutes later. The security code could have been a coincidence but my subscription was restored about 30 minutes after getting the email. May be coincidental timing, but I've never gotten a phish mail that said it was from Apple. I get daily phish mails that pretend to be from Google or Fedex. Interestingly, the iCloud settings page still shows my 200GB subscription as active. It really doesn't look "Apple-esque", so...I just assumed it was phishing. I got the '50GB discontinued' email. Looking around on the iPhone, I noticed it did seem to have a problem with the account, so I resubmitted some of the information on the card entry. Nothing had changed, but there are entries that don't show up after you submit, for security, so you can't tell if they were right before. We'll see what happens. If they had problems charging an account, I'd expect an e-mail, 'we had problems charging the account - go fix it'. Not, we discontinued your subscription, with no other information. May be coincidental, but it appears to me that there’s a huge batch of phishing emails being circulated. I didn’t keep a screenshot, but I recently had a very poorly-constructed phishing email purporting to be from Apple appear in my mailbox, alluding to the usual “problems with my account." 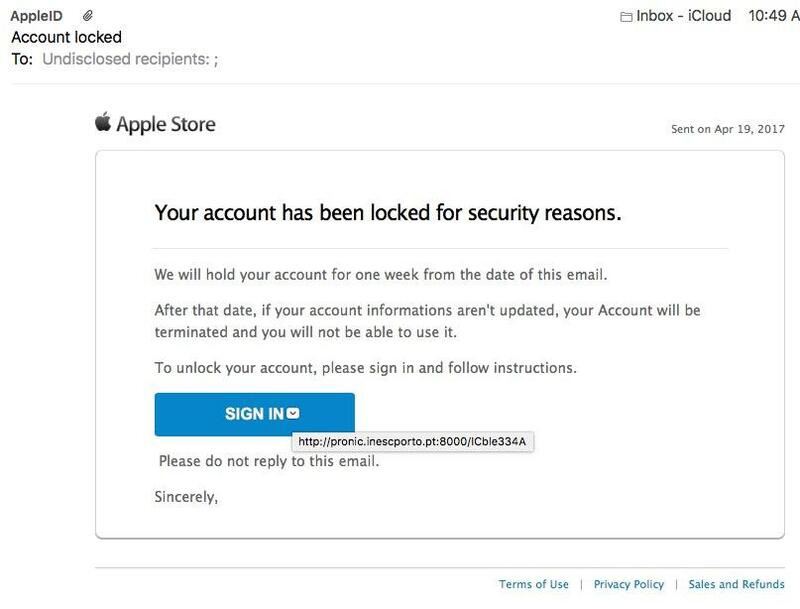 Unfortunately for the sender, the first dead giveaway was that the email was sent to an email account that has no affiliation with my Apple address or even the backup email addresses. Second giveaway was that the headers showed an Apple-like address, but not a real Apple sender domain. Thirdly, there was a link at the bottom which didn’t even say it was to an Apple domain. . .and I unmasked the URL further to discover it pointed to a malware site. Fourth, there was a disclaimer at the bottom of the email. . .in Portuguese. DOH! Netizens, beware! They’re after us! I had this happen to me on the 15th. I received two emails stating my 50GB plan was cancelled, effective immediately, due to billing issue, with no prior warnings of a problem with the charge. Next was an email saying my iCloud storage was full. 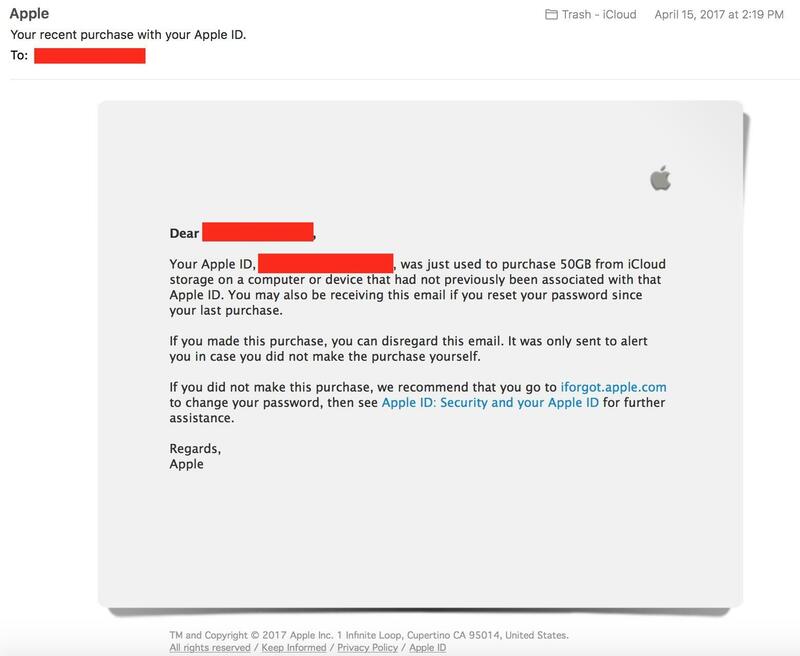 After updating my billing information, I received an email stating the purchase was made from a device not previously associated with my Apple ID... The last new Apple product to use my ID was my new MacBook, which has been using it for a few months now. I find it odd that I also received a phishing email around that time. It was in my junk folder when I discovered it. No, I didn't fall for it.